Experience the Roman Forum with AESU! 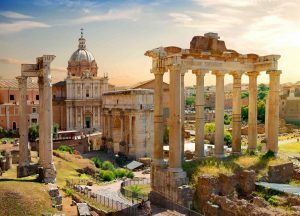 The breathtaking display of ruins that spread across the center of Rome was once a proud marketplace known as the Roman Forum. The site was first developed in the 7th century BC and served as a district for social, political, and commercial dealings. After the fall of Rome, the once thriving hub was left in total destruction, and the ruins remain today for tourists and locals to remember the ancient civilization by. Before the building of the Roman Forum began, architects first had to drain the site with a machine they created called the Cloaca Maxima, which translates literally into Greatest Sewer. The machine was thought to be presided over by the goddess, Cloacina. Each year, the ancient ruins attract roughly 5.1 million tourists. Visitors also have access to the Palatine Hill and The Colosseum, and typically Admission is valid for up to two days. The size, grandeur, and sheer beauty of the Roman Forum can easily provide a full day’s worth of entertainment for the average tourist. After the 8th century, travelers had deemed the site “Campo Vaccino” or, the cow field, due to the new inhabitants who grazed the ignored portion of the city. It became a popular site for artists who wanted to capture the essence of the once great and noble marketplace. The British painter, J.M.W Turner famously painted the decaying Roman Forum, covered in fog and livestock, during his travels through Italy. There were three main objectives of achieving excavation: Restore fragmented pieces of columns to their original locations, reach the lowest possible level of the forum without damaging the structure, and identify half-excavated structures. The excavation began in 1898 and lasted for over 100 years. This entry was posted on Wednesday, June 28th, 2017	at 11:19 am	. You can follow any responses to this entry through the RSS 2.0	feed. Responses are currently closed, but you can trackback from your own site.